The ALEXA XT Plus (XT = Xtended Technology) is the most versatile and flexible of the ALEXA XT camera range, and thus a true allrounder. With an integrated wireless receiver for camera and lens remote control, built-in tilt and roll sensors, a DNxHD license and additional connectors for camera and lens control, signal output and accessory power supply, the ALEXA XT Plus offers the best value for anyone who can live without an optical viewfinder. Like all ALEXA XT cameras it has a Super 35 sensor with Open Gate and 4:3 sensor modes, in-camera ARRIRAW up to 120 fps, ProRes 4444 XQ, ProRes 3.2K, internal ND filter, Lens Data System, integrated CDL capture, ARRIRAW checksum, included anamorphic de-squeeze and high speed licenses, new viewfinder mounting bracket as well as a new, super silent fan. The ALEXA XT Plus is available either as a complete camera package or as an upgrade to the basic ALEXA XT. (1) ALEXA HD and HD Plus do not include and cannot be upgraded to ARRIRAW, ProRes 2K, ProRes 3.2K, ProRes 4444 XQ, DNxHD 444, 4:3 sensor mode, 3D sync, pre-recording, SxS PRO+ support or the XR Module. 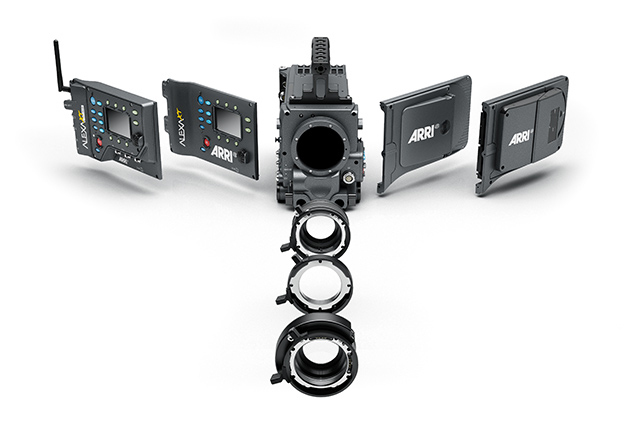 (2) Only ALEXA XT cameras and ALEXA Classic cameras with the XR Module upgrade. (3) 4:3 sensor modes only for ALEXA Plus 4:3, ALEXA M, ALEXA Studio and all ALEXA XT models. (4) only for alexa xt, alexa xt m and alexa xt plus. Alexa xt studio has its own motorized nd filter solution. With its built-in radio and lens motor electronics, the ALEXA XT Plus makes working on the set faster and more efficient. Plug the ARRI lens motors directly into the camera, turn on the wireless hand unit (like the WCU-4) and off you go. Integrating the wireless and lens control infrastructure into the camera not only saves time, but also weight, as a setup with an ALEXA XT and an external motor control box would be more cumbersome to cable and heavier in sum. Compatibility with the ARRI hand units, like the WCU-4, as well as with the cmotion hand units makes this a supremely flexible tool. Using the full ALEXA sensor area, Open Gate mode is great for VFX shows, up-sampling to 4K, image repositioning, resizing, rotating or stabilizing. While some use it as their main recording format, others shoot in 16:9 or 4:3 and only certain scenes in Open Gate. For the most effective use of anamorphic lenses, each ALEXA XT model is equipped with an Open Gate sensor of the same size and shape as a Super 35 mm film frame, a feature only found on ALEXA digital cameras. The 4:3 sensor mode is crucial for delivering the unique and cinematic widescreen look that can trace its origins back to the CinemaScope films of the 1950s. It is a look that has long been appreciated by cinematographers, directors and the viewing public. For convenient viewing of anamorphic images an anamorphic de-squeeze license is included with all ALEXA XT cameras. 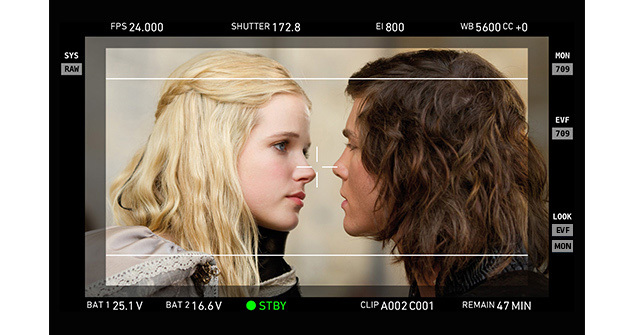 In the images below, the sensor area used for shooting with anamorphic lenses is shown. Since an anamorphic lens squeezes the CinemaScope 2.39:1 image by a factor of 2, it needs a sensor area with a 1.195:1 aspect ratio. Film (orange) and the ALEXA sensor (blue) are tall enough to easily accommodate this, as can be seen in the left image. Since film and the ALEXA sensor have almost exactly the same dimensions, they exhibit the same angle of view for anamorphic lenses, which will be welcome news for cinematographers. Cutting the required 1.195:1 aspect ratio out of a 16:9 sensor (right image) results in a significantly smaller sensor area (grey area), which means fewer photosites and a different angle of view than what cinematographers are used to. The 4:3 sensor is also useful for productions shooting with spherical lenses, as it permits the placement of tracking markers above and below the image, a shooting method popular with VFX heavy feature films. Alternatively, the extra room can be used for reframing in post, similar to shooting 4-perforation 35 mm. All ALEXA XT cameras come with the new XR Module (Xtended Recording), a side panel that was co-developed with Codex to replace the previous SxS Module. The XR Module allows in-camera recording of uncompressed and unencrypted ARRIRAW, ALEXA’s highest quality image output, all the way up to 120 fps in full image quality. This not only makes for a smaller, lighter and more affordable camera package, it also simplifies setup and operation while avoiding unnecessary cabling. ALEXA XT cameras record ARRIRAW onto exceptionally fast and rugged 512 GB XR Capture Drives, including advanced and time-saving features such as capturing the ASC Color Decision Lists (CDL) and a checksum for each frame into metadata. Once removed from the camera, the XR Capture Drive offers a number of different paths into post for every budget and time schedule demand, using the proven Codex workflow. As an alternative to ARRIRAW it is also possible to capture ProRes or DNxHD in-camera. ALEXA XT cameras provide two unique ProRes recording features: ProRes 4444 XQ, the highest quality ProRes codec, and ProRes 3.2K, the ideal recording resolution for an up-sample to 4K UHD or for extra room to resize, reframe, rotate or stabilize a 2K or HD image. Additionally, the XR Capture Drives allow for significantly longer recording times and faster speeds: ProRes 4444 can be recorded for a total time of 107 minutes (at 24 fps) and can be recorded as fast as 120 fps. Recording onto SxS PRO or SxS PRO+ cards is also possible: with the SxS Adapter ProRes or DNxHD can be recorded to a single SxS PRO or SxS PRO+ card, thus protecting the inventory of existing cards. And with the CFast 2.0 Adapter it is possible to record onto CFast 2.0 cards, the same medium used by AMIRA, the new documentary style camera. A high speed license for filming at up to 120 fps in 16:9 and 96 fps in 4:3 is included with all ALEXA XT cameras. Compositing in post is greatly sped up through the use of lens metadata carried inside the ARRIRAW, ProRes or DNxHD files. The lens metadata allows to automatically match the computer graphic images to the images taken with the real lens, a process that used to take a long time of manual tweaking. In the example below, a new car was inserted through computer graphics (right image) into an image that originally contained a stunt car (left image). The lens metadata was used to exactly duplicate focus, depth of field, perspective and minor distortions introduced by the real lens. An increasing number of productions are setting up on-set color correction systems so the cinematographer can create and monitor a pre-grade of the footage. When shooting ARRIRAW, the resulting ASC CDL (American Society of Cinematographers Color Decision List) can be automatically transferred to ALEXA XT cameras and stored as metadata for fast and convenient retrieval in post. To provide maximum comfort for the operator, the Viewfinder Mounting Bracket VMB-3 is strong and rigid, which has been achieved through a complete re-design of the previous model and the use of two 15 mm lightweight rods. These rods also facilitate rapid changes in camera support, i.e. from a tripod to a crane or Steadicam, since accessories such as lens motors or follow focus units can be hung from them rather than cluttering up the base plate. A special anodizing process is used on all moving parts for a very hard yet low-friction surface and a bubble level allows for speedy leveling of the camera. Available as a separate accessory is the Viewfinder Extension Bracket VEB-3, with a sturdy design and a fold-out arm that holds the viewfinder securely in place when moving the camera. 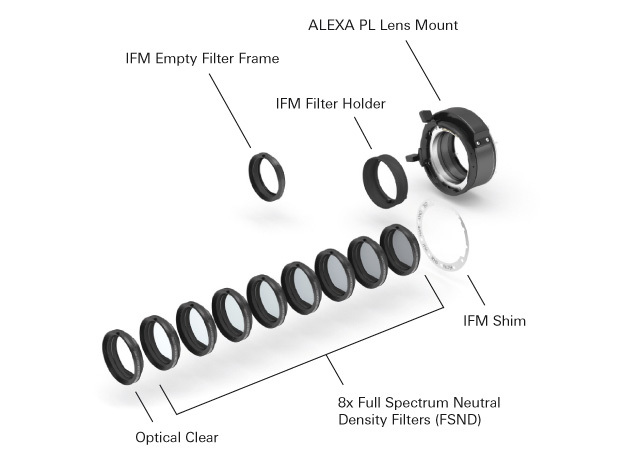 To render images with a film-like, organic look, all components of the ALEXA imaging chain are proprietary high performance custom designs: the optical low pass filter, the CMOS sensor, the electronics hardware imaging engine and the image processing software. The ALEXA sensor provides high dynamic range images through an unequalled exposure latitude of more than 14 stops (as measured with the ARRI Dynamic Range Test Chart) with special consideration given to highlight treatment. Creating a good looking roll-off in the highlights is probably one of the most difficult tasks for any sensor designer and we have spent enormous resources at insuring exceptional highlight handling. ALEXA’s wide exposure latitude translates into a ‘thick’ digital negative; there is more detail information in the highlights and in the dark areas than any of the current display technologies can disclose. This means tremendous flexibility when color grading and makes ALEXA images future-proof for high dynamic range (HDR) display technologies. Because of ALEXA’s great overall image quality, its images can be easily up or down-sampled for spectacular HD, 2K, 4k UHD or 4K Cine deliverables. We know what it is like to try to change frame rate and shutter angle 12.11.14 in the morning in the rain after a long night shoot. We know that a camera needs to be very simple to operate, and everything about its design must ensure that you get a good image, no matter what. The ALEXA user interface has been specifically developed to be easy to learn and quick to operate. The same interface is used on all ALEXAs, with the same menu, buttons, etc., so there is no learning curve when using another model ALEXA. The hardware of the camera is designed for the best and most ergonomic use on the set, including the built-in shoulder cut-out, large number of accessories like the Low Mode Support LMS-3, the Remote Control Unit RCU-4 or the Wireless Compact Unit WCU-4, down to little details like differently shaped extrusions (eyebrows) above some buttons so the operator can feel the button’s position even from the other side of the camera or when shooting in low light. Four major components are specifically designed to allow an easy upgrade and to add new features in order to extend its useful life. 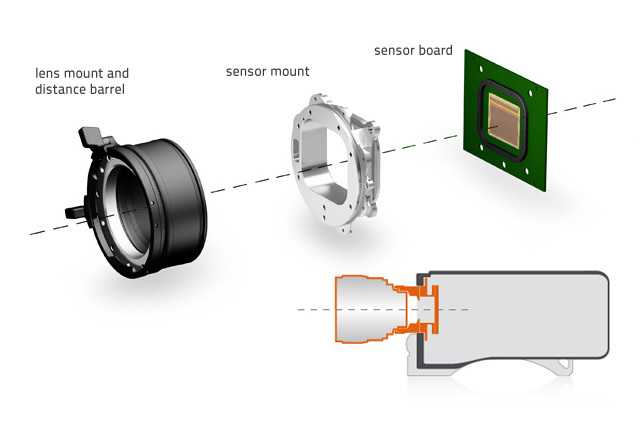 First, taking into account the rapid rate of change in storage technologies, the in-camera recording module on the left side of the camera is removable, featuring an SxS Module for ALEXA Classic cameras (which can be upgraded to an XR Module) or an XR Module for ALEXA XT cameras. Second, the camera control electronics on the right side can be replaced with an upgrade such as the Plus panel, for wireless camera and lens remote control. Third, the Exchangeable Lens Mount (ELM) allows the use of PL, PL LDS or Panavision lenses, further extending creative options. And finally, ALEXA’s processors are based on FPGAs (Field Programmable Gate Arrays), a technology that permits the camera’s feature set to be completely re-programmed. Thus ALEXAs can be quickly and easily upgraded with our free-of-charge Software Upgrade Packets (SUPs) and licenses available for purchase. Past SUPs have added exciting features like ProRes 2K, ProRes 4:3, pre-recording, self-healing metadata, compatibility with new gear (like the WCU-4, the Ultra Wide Zoom UWZ 9.5 – 18 or SxS PRO+ cards) and advances in image quality like greatly improved debayering algorithms. Licenses are available to upgrade ALEXAs with high speed, anamorphic de-squeeze or the Avid DNxHD codecs. This great compatibility coupled with ALEXA’s hardware and software modularity allowed us to keep ALEXA cameras relevant, which translates into a long and reliable product cycle. ALEXA represents the most efficient and versatile method to capture and then transport images, audio and metadata through the production process. This is achieved with a multitude of output options, support for the native codecs of the most popular non-linear editors, complete metadata and integrated color management. ALEXAs can easily integrate into any digital workflow, be that a high-end Hollywood feature film that shoots ARRIRAW, a TV series that shoots ProRes 4444 Log C or a Telenovella that needs to optimize throughput by shooting ProRes 422 Rec 709. The ALEXA XT family of cameras expands on the many options of the ALEXA Classic cameras with new in-camera recording choices. Below is a overview of the ALEXA XT family of cameras outputs. Sensor 35 format ALEV III CMOS sensor with Bayer pattern color filter array. Operating Modes 16:9, 4:3 Full, 4:3 Cropped or Open Gate sensor modes. Switching takes approx. 60 seconds. 16:9 available for ARRIRAW, ProRes and DNxHD recording. 4:3 Full available for ARRIRAW and ProRes 2K recording. 4:3 Cropped and Open Gate available for ARRIRAW recording. Regular or High Speed mode. Switching takes approx. 20 seconds. All speeds adjustable with 1/1000 fps precision. To record above 60 fps, the camera needs to be switched to high speed mode. Note: some limitations based on recording media or recording file settings apply. Shutter Electronic rolling shutter, 5.0º – 358.0º up to 60 fps; 5.0° to 356° above 60 fps. Shutter angle adjustable with 1/10 degree precision. 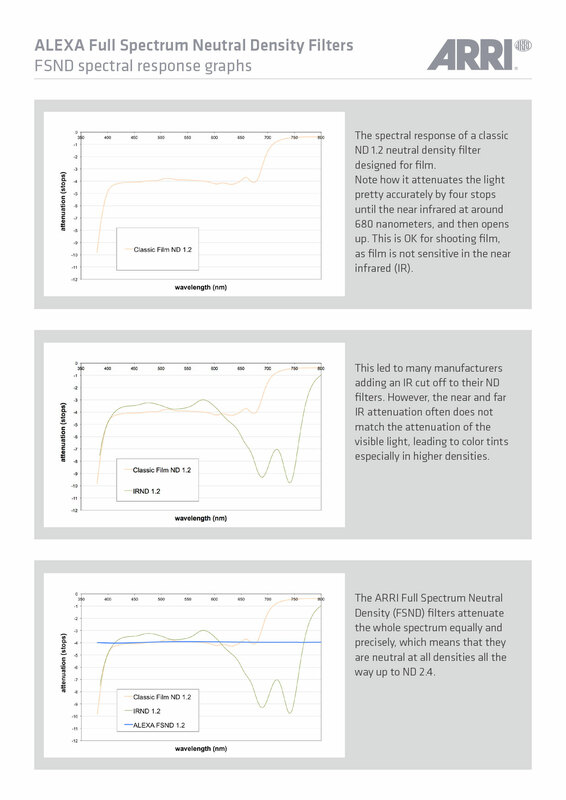 Exposure Latitude 14+ stops for all sensitivity settings from EI 160 to EI 3200, as measured with the ARRI Dynamic Range Test Chart (DRTC). Color Correction While white balance changes the red/blue hue of the image, color correction changes green/magenta. Adjustable range from -12 to +12 CC. 1 CC corresponds to 035 Kodak CC values or 1/8 Rosco values. Sound Level Under 19 db(A) while recording ProRes 4444 16:9 HD @ 24 fps and ≤ +30° Celsius (≤ +86° Fahrenheit) with lens attached and fan mode set to ‘Regular’, measured 1 m/3 feet in front of the lens. Silent operation at higher temperatures possible with fan mode set to ‘Rec low’. Power In Three possible inputs: BAT connector, optional battery adapter back or optional battery adapter top. All inputs accept 10.5 to 34 V DC. Approx. 90 W power draw for camera and EVF-1 in typical use recording ProRes at 24 fps to an SxS PRO card at room temperature, without accessories. Initial power draw during power up is higher. Power Out 12 V connector: limited to 12 V, up to 2.2 A. RS, EXT and ETHERNET: input below 24 V is regulated up to 24 V; above 24 V: input voltage = output voltage. RS and EXT connectors combined are limited to 2.2 A. ETHERNET is limited to 1.2 A. Maximum power draw is also limited by the power source. Weight ALEXA XT Plus body with XR Module: 7.3 kg/16.1 lbs. ALEXA XT Plus body with XR Module, electronic viewfinder and handle: 8.7 kg/19.2 lbs. Environmental -20° C to +45° C (-4° F to +113° F) @ 95% humidity max, non-condensing. Splash and dust proof through sealed electronics. System cooling through radiator/single fan. Lens Mount 54 mm stainless steel LDS PL mount, Super 35 centered. 52.00 mm nominal flange focal depth without FSND filters. 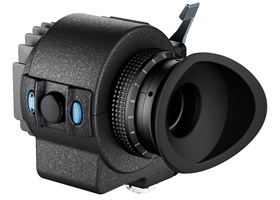 Viewfinder Low latency (≤1 frame delay) electronic color viewfinder ARRI EVF-1 with 1280 x 784 F-LCOS micro display (image: 1280 x 720, status bars: 1280 x 32 above and 1280 x 32 below image) and ARRI LED illumination, both temperature controlled. Image can be flipped for use of viewfinder on camera left or right. Viewfinder Mounting Bracket allows movement of viewfinder forward/backwards, left/right, up/down, 360 degree rotation and placement on camera left or right. EVF-1 controls: viewfinder and basic camera settings, ZOOM button (2.25x magnification ‘pixel to pixel’), EXP button (false color exposure check) and jog wheel. Control Camera right: Main user interface with a 3” transflective 400 x 240 pixel LCD color screen, illuminated buttons, button lock and jog wheel. Camera left: Operator interface with illuminated buttons and button lock. Camera acts as a web server, displaying the ALEXA Web Remote on web browsers of computers connected to ETHERNET connector. Optional accessory Remote Control Unit RCU-4 for cabled remote control via camera ETHERNET connector. Optional accessory Wireless Compact Unit WCU-4 for wireless remote control. Monitor Output 2x MON OUT BNC connector for uncompressed 1.5 G HD-SDI video: 1920 x 1080 (16:9), 4:2:2 YCbCr; legal range HD video at 23.976, 24, 25, 29.97, or 30 fps. Embedded audio, time code, metadata and recording flag. 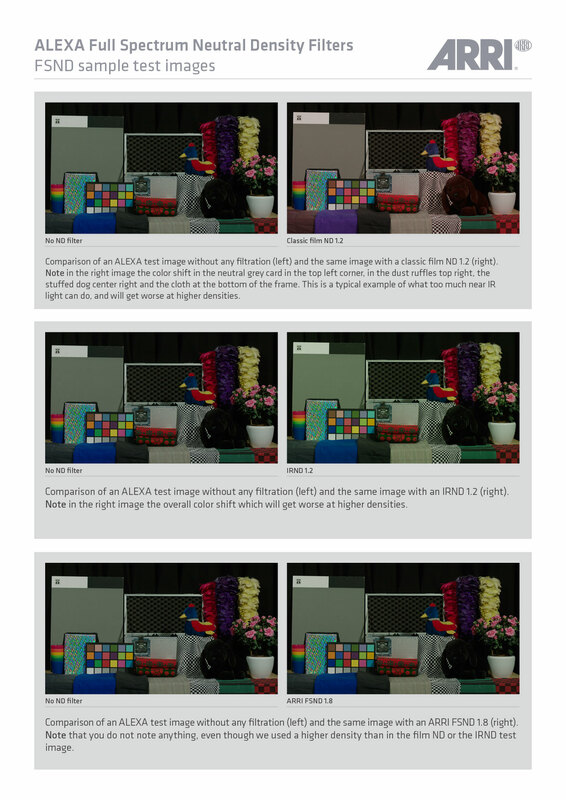 Image Processing 16 bit linear internal image processing in full ALEXA native color space. Target output color spaces for ProRes, DNxHD, REC OUT and MON OUT: Log C or Rec 709. 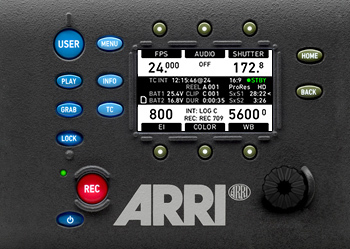 For Rec 709, a customized look can be applied during record and playback with ARRI Look Files. Optional horizontal image mirroring. Synchronization Master/Slave mode for precision sync of settings, sensor, processing, HD-SDI outputs and QuickTime/ProRes or MXF/DNxHD recording for 3D applications. PHASE user button for shifting camera phase to move phase artifacts out of frame, i.e. when shooting a CRT monitor or rear screen projector (works in Rec Run TC mode). Playback Playback of ARRIRAW, ProRes or DNxHD from XR Capture Drive or playback of ProRes or DNxHD from SxS PRO or SxS PRO+ cards visible on EVF-1, MON OUT and REC OUT. Playback audio available over headphone jack and embedded in the MON OUT and REC OUT signal. Audio 1x XLR 5 pin AUDIO IN for 2 channel, line level, balanced audio. 24 bit/48 kHz A/D conversion. Uncompressed PCM audio recording to ARRIRAW, ProRes, DNxHD (1) and embedded in all HD-SDI outputs. Only available with same project/sensor speed at 23.976, 24, 25, 29.97 and 30 fps. Max of 2.5 dBm output from AUDIO OUT headphones connector. BNC connectors designed for fast exchange without camera disassembly. These connectors require a special tool. 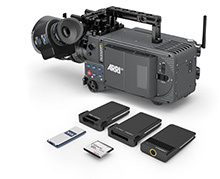 SD Card For importing and storing ARRI Look Files, camera set up files, frame line files, feature license keys, user pixel masks and custom lens tables for the Lens Data Archive (LDA). Stores captured stills from the REC OUT image path in TIFF (.tif, 16 bit), DPX (.dpx, 10 bit) or JPEG (.jpg, 8 bit) format (1). Stores log files. Also used for installing Software Update Packets (SUPs). Upgrades The Storage Interface Module can be exchanged for future storage modules. The Electronics Interface Module (available as either regular ALEXA or ALEXA Plus versions) can be exchanged for future control electronics. An easily exchangeable lens mount allows other lenses beyond PL mount lenses to be used. Simple camera software updates via free of charge Software Update Packets (SUPs) and payable license keys – Anamorphic De-squeeze (included), High Speed (included) and DNxHD (included). (1) Frame grabs are not possible during High Speed, 16:9 2K, 16:9 3.2K, 4:3 2K, Open Gate or when the option ‘REC OUT = MON OUT Clone’ is chosen. Note: Technical data based on Software Update Packet SUP 11.0 (ALEXA XT/XR).